Take a journey through a tight winding river that opens up into an ancient pond formed by beavers who are active to this day. See beaver lodges, turtles, birds and unique carnivorous plants! Paddle the Mullica River from Atsion Lake to Lock’s Bridge. This trip will take approximately two to two and a half hours to complete with a short break mid-way. Trip length is based on the average time it takes our customers to to paddle this section. Although many beginners choose this trip because of it’s short duration, this is not a good trip for beginners due to many sharp turns in the first part of the trip. Beginners should choose the “shorty“! You may also consider our 4-hour Batsto River trip from Quaker Bridge to Batsto Lake. The Mullica River 2-hour Trip, from the launch point just off of the route 206, Atsion Lake spillway to Lock’s Bridge at Beaver Pond is an enjoyable paddle in any season. 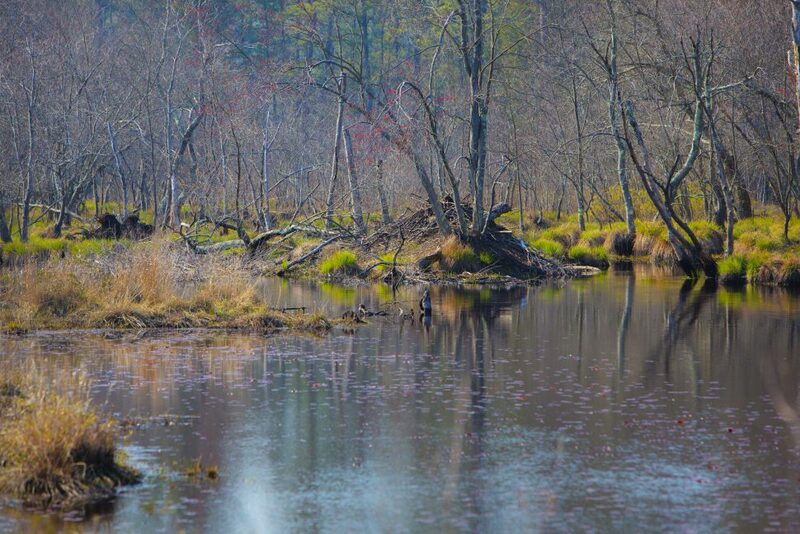 Beginning as a narrow stream, the Mullica soon widens into the beautiful, wide-open area known as Beaver Pond. This area shows in great detail the former width of the post-glacial ice and water flows (that) this area experienced at the end of the last ice age then kept open by the tedious work of beavers over the generations. This is an excellent trip for paddlers who wish to keep a trip to an approximate two-hour time schedule. There are multiple landing opportunities to allow for an exploration into the woods or for a quick snack on the river’s bank. Once you enter the wide-open pond area, you may wish to pull your canoe to the side and observe the expanse from the elevated bank. This area is incredibly rich for those with an interest in photography and the varied habitat and wide-open expanse is sure to be pleasing for anyone drawn to great scenery. See Beaver Lodges, Beaver Dams, Pine Barrens Turtles, Birds and Unique Carnivorous Plants! Beginning paddlers should request a shortened version of this trip (the “shorty”) that cuts out the portion of the river with sharp turns. Single kayaks may be the best choice of boat as turning a kayak is generally a straightforward process, even for a beginner. However, experienced paddlers will do well with either a kayak or canoe. There are two sections of small beaver dams that will need to be either floated over or portaged around, depending on the water level at the time. As water still flows over these small dams, an accurate paddler can aim for the flowing section and make it across with just an extra push or two of the paddle at the appropriate moment. At the locations of the dams, there are small beaches where one can stop and grab a snack or photograph before continuing on the journey. The depth can be as shallow as 1-2 feet in some areas and as deep as 6 feet or more in times of high water. The end point of this trip is (at) the former site of Lock’s Bridge (only posts remain) at the end of the beaver pond the river narrows once again, there a medium sized beach on the left allows a paddler to easily exit the river. Trip begins at Pinelands Adventures headquarters.